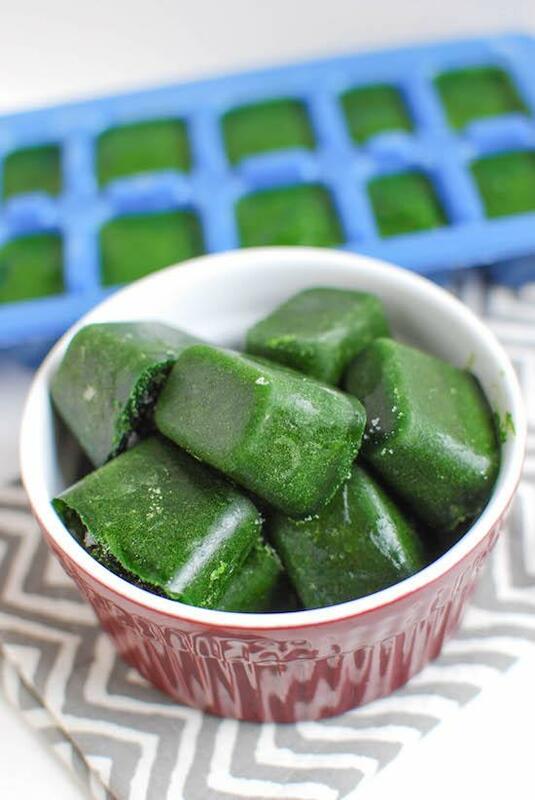 Stock your freezer with these Frozen Spinach Cubes and toss a couple into your next smoothie for a nutritional boost! The perfect way to save spinach or kale that’s about to go bad! I have a pretty polarizing relationship with smoothies. I’m either LOVING them, or I want absolutely nothing to do with them. Currently, I’m in a loving phase and I’ve been making one pretty much every day. 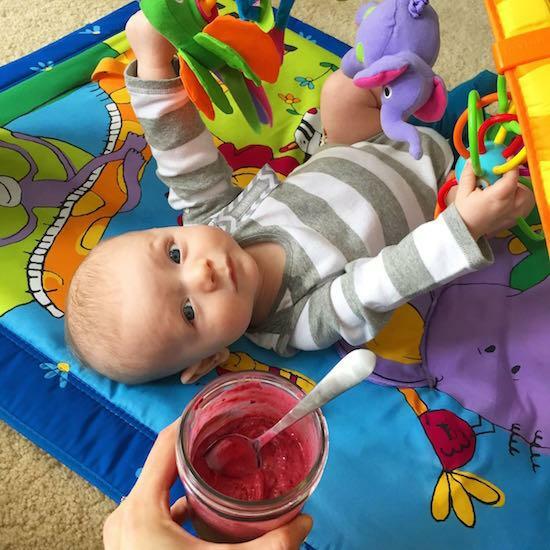 As I’ve mentioned, lunch can be a bit of a challenge some days around here with Squish running our schedule, so quick, easy smoothies are becoming a go-to lunch. A few weeks ago, I bought some spinach to make a Strawberry Spinach Salad and had some leftover. Right before it went bad, I remembered a little trick for turning it into frozen spinach cubes using a blender. I used my Blendtec. I shared it on Instagram and Facebook a few years ago and it was a big hit. I certainly didn’t come up with this myself, but it’s a tip I love to share because a lot of people don’t think of it on their own! 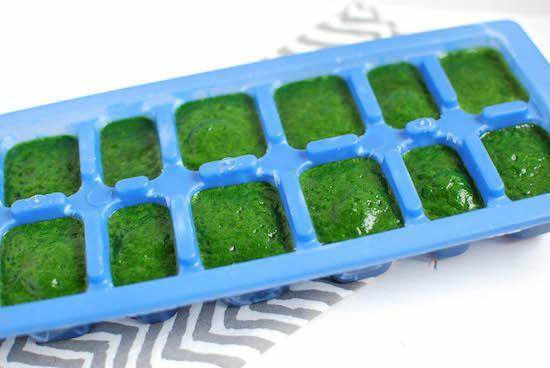 Blend up spinach (or kale) and freeze it in ice cube trays! Store them in the freezer add them to your next smoothie. Like I mentioned, this is a great way to use up leafy greens before they go bad, but this also makes a great food prep project if you want to just buy it fresh and make a bunch of cubes at once. 1. 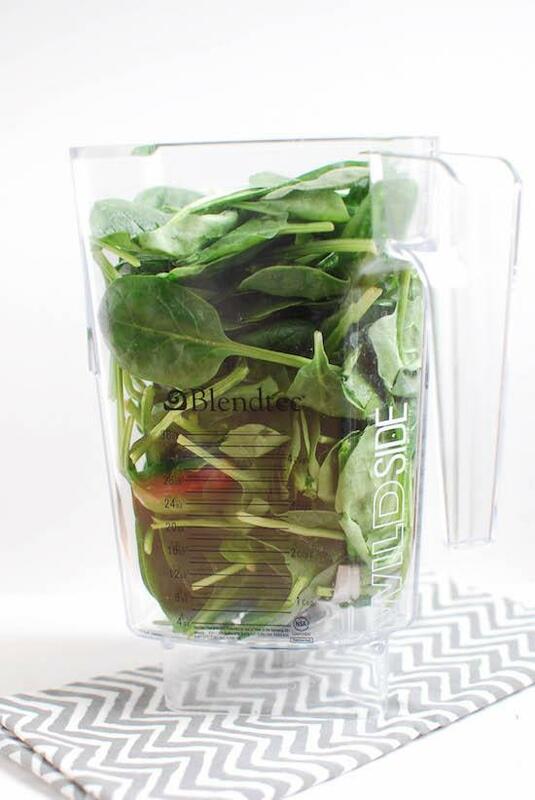 Add spinach to your blender. 2. Add a little bit of water & blend until smooth. The amount of water will vary but I usually use 1/4 cup or so. 3. Pour into ice cube trays and freeze. Store in the freezer & add to smoothies. 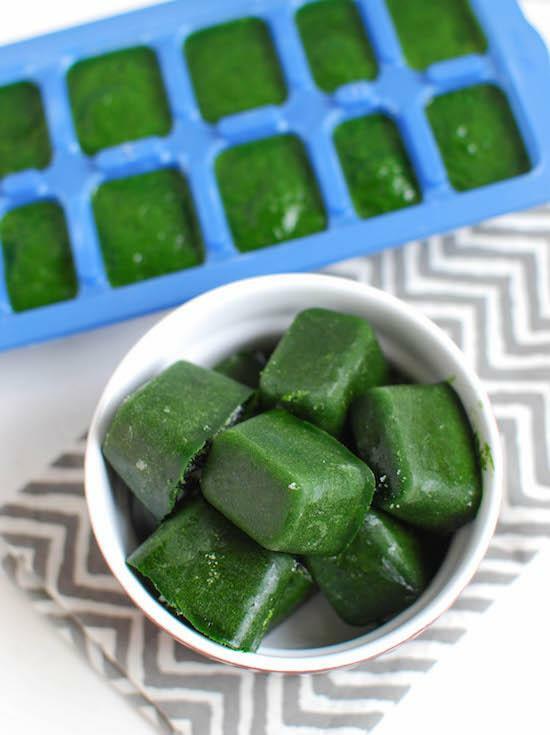 Stock up on Frozen Spinach Cubes from @LeanGrnBeanBlog and add some to your next smoothie! I use my Blendtec to make these and hit the smoothie button. It takes 30 seconds or so, but once it really ramps up, it pulls down all the spinach and blends it without a problem. I’ve heard some people make these with no water but I never have much luck with that. If you purchase an item from Amazon.com using the links in this post, The Lean Green Bean will receive a small commission for the sale – at no added cost to you. This allows us to cover site-related expenses and helps support the growth of my blog! I’m not sure that I should be this excited, but I am. What a great and easy idea. I’ve been in smoothie mode too lately (ever since I won my Blendtec 🙂 ), and I just love this idea. isn’t it just the best blender?! 🙂 love mine! I remember when I was younger my mom used to make these types of things and I always thought they were so gross! HA HA! Now, I would just nosh on those ice cubes as a refreshing “treat” on a summers day! Thanks for the tip! I usually go through spinach so fast that I never even think of having to freeze it. Maybe I’ll just buy a bag just for frozen cubes? I’m all in to the smoothies right now 🙂 so Thank You! ice cube trays are such a great tool! I freeze everything in them but have never thought about spinach, great idea. My favorite combo is blueberries, sunflower butter, spinach, chia and a date with almond milk. So good! i’ve been loving sunbutter lately! This is great! We have a huge thing of spinach in our fridge and I know we won’t use it all. I’ll definitely be making these! Awesome idea! I am not quite in the smoothie mood with the foot of snow that just dumped down on us, but this will be great to remember when it starts to warm up again! Plus no more wasted spinach! I can never seem to eat it fast enough! genius! I hate when spinach goes bad. Perfect for baby too! What an awesome idea! There have been too many times where my spinach has gone semi-bad and I end up having to throw it away. Spinach cubes ftw! If I do enough spinach at once I don’t need to use water, but if not I need to add a little. I love having these spinach cubes on hand! great combo! i need more mango in my life! I love doing this with my spinach…it’s a great way to keep from wasting food. Love this! That would be perfect for my Iron Woman smoothie with the frozen butternut squat and frozen mango. Thanks! never tried squash in a smoothie. genius! I discovered this idea a few weeks ago and IG’d it – so brilliant! Loving this!! I have the same smoothie relationship as you, and I’m currently in the “stay away” phase. Will be using your trick for when I get back into the groove!! I have seen a lot of the ice cube tray stuff including this & such great ideas!!!!!!! Awesome tip, Lindsay! It seems so obvious and yet I have never done it. What a great way to salvage greens that are about to go bad, too! Whenever my fresh spinach is about to go bad, I just take it out of the original bag/container, put it in a ziplock and get all of the air out before sealing and pop it in the freezer. I break off a chunk whenever I want to use it for smoothies or throw a little into a dish when cooking! I am the same with smoothies either love them or hate them. Right now I’m in the love phase. This is one of the best tips ever! Good idea! Since we moved to Chicago, I really hate going out to Costco on a regular basis. My husband and I make smoothies every morning so we go through a LOT of greens. In order to stretch out my Costco trips, we keep half the bags in the fridge and half in the freezer so they don’t go bad. I also put a paper towel in the fridge bags to keep them fresh longer! My favorite smoothie right now is chia, greens, apple, lemon, ginger, and turmeric! oh that sounds like a great combo! I always mean to do this and then forget! Thanks for the reminder! This is so SMART! I know this is something my boyfriend will love. So genius! I’m pretty standard and love the strawberry/banana/chocolate combo. I add green stuff and seeds/nuts from there, but that’s usually my base! that’s a great combo in my book! Haha, I usually just put spinach and greens in a big plastic bag to freeze and take as needed! I just did a post yesterday about prepping smoothies for the freezer. I froze plain Greek yogurt in the ice trays instead. I love this idea too! Thanks for sharing! i do that too! great idea! What a great idea! must try! Great tip! I love doing that for kale, I think it reduces that “garden” taste in my smoothies. Did you know that you can freeze fresh spinach leaves just right in the freezer, no prep? I LOVE doing that when some are about to go bad and I don’t have time to make cubes. I even pack fresh spinach in ziplock bags for premade smoothies! Second, this is such a great idea! 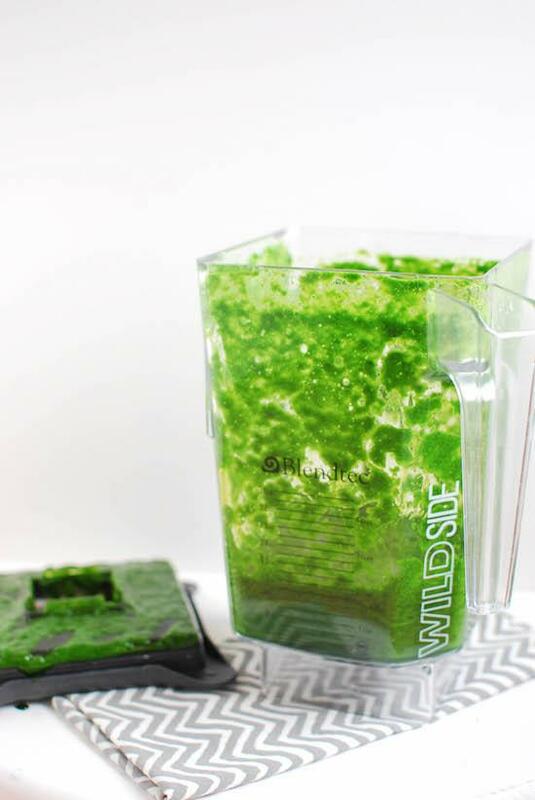 We usually saute our greens when they are about to go bad, but since we use them in our smoothies daily, the ice cubes are even better for us. mmmm yum! no greens needed for that! Such a great idea. I do it with basil in summer…. This is such a great idea! I would of never thought to do that. It’s a great way to save spinach if it’s about to go bad. Oh man I’m on SUCH a smoothie kick right now! It’s really an easy way to boost my nutrition and I’m amazed at the effects. These spinach cubes really excite me because I always feel like I have greens going bad! And I’m super picky with my greens so if they are a little soggy…blech! This is just genius! Maybe I can stop throwing away half bags of spinach! I am going to use coconut water – I can’t drink it straight. This is a great way to still get the benefits. How many cubes do you use per serving? [WORDPRESS HASHCASH] The comment’s server IP (192.0.83.32) doesn’t match the comment’s URL host IP (192.0.78.25) and so is spam. [WORDPRESS HASHCASH] The comment’s server IP (192.0.81.32) doesn’t match the comment’s URL host IP (192.0.78.25) and so is spam. [WORDPRESS HASHCASH] The comment’s server IP (66.85.131.210) doesn’t match the comment’s URL host IP (104.27.186.29) and so is spam. [WORDPRESS HASHCASH] The comment’s server IP (50.62.160.232) doesn’t match the comment’s URL host IP (184.168.47.225) and so is spam. [WORDPRESS HASHCASH] The comment’s server IP (50.87.144.95) doesn’t match the comment’s URL host IP (192.232.218.114) and so is spam.